I praised the previous episode for transforming what could’ve been filler into a thoughtful character study. “Suckas Need Bodyguards,” however, isn’t quite so successful. 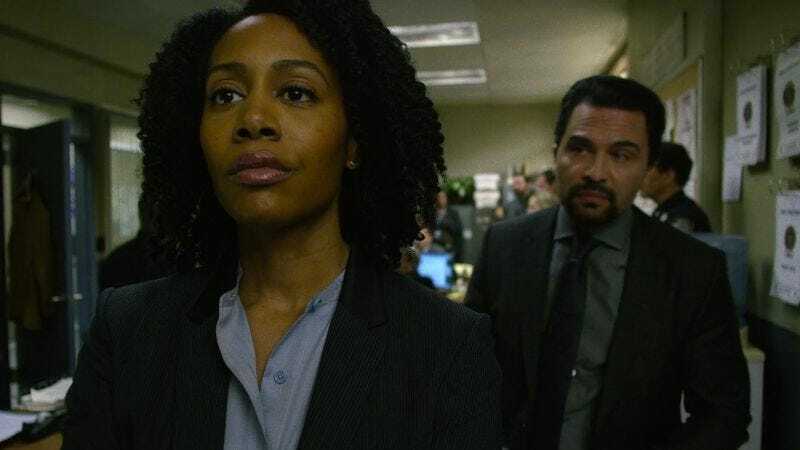 This is the first episode of the season that felt noticeably clunky and it doesn’t help that it centers largely on one of the show’s least developed characters, Detective Rafael Scarfe. Frank Whaley turns in a fine, idiosyncratic performance, but the attempt to transform Scarfe into a sympathetic figure who is carrying around guilt over his son’s death is too little too late. And because he’s kept away from Misty for most of the episode, there’s no chance for the show to deepen their relationship so that we really feel for her when her partner dies. Sure their tofu and basketball banter from a few episodes ago was cute, but that’s not enough to sell me on the deep, deep friendship they supposedly have. Now don’t get me wrong, even a so-so episode of Luke Cage is better than the vast majority of television. And there are plenty of individual moments that work here. But there’s also an inelegance to this episode’s plotting that relies too much on coincidence to get the pieces in place. For instance, it’s a little convenient that not long after Luke decides he wants to take down Cottonmouth for good, a dirty cop with the ability to do just that shows up injured and vulnerable in his barbershop. And it’s even more convenient that Luke stumbles upon a wounded Scarfe while he happens to be hanging out with the most chill nurse in New York. It would’ve made sense if Scarfe’s injuries were what inspired Luke to seek out Claire Temple, who helped him back in Jessica Jones. But here it’s just a massive coincidence that he happens to be eating at Claire’s mom’s restaurant just moments before he’s in need of a discreet medical professional. The non Scarfe-centric parts of this episode center mostly on Mariah and her increasing inability to separate herself from her cousin’s illegal activity. And while I will never get tired of watching Alfre Woodard switch from Mariah’s pleasing public persona to her more blunt real-life personality (“You wanna watch me whip and nae nae, Thembi?”), I do feel like I’m still struggling to get a grasp on her as a character. There’s no doubt Mariah’s desire to help Harlem is genuine, but how much of what she’s selling does she actually believe? Because even in private, her dreams for Harlem seem incredibly optimistic. So she’s not just talking a good game for the sake of her campaign. But on the other hand, she’s a complete pragmatist when it comes to Cottonmouth. (God bless her for finally be the first person on this show to voice the idea of drowning, burning, and/or poisoning Luke, which sounds a whole lot easier than making magic space bullets). I don’t completely understand how Mariah’s optimistic and pragmatic halves cohere, but hopefully she’ll become a little less opaque the more time we spend with her. Mainstream media only wants to talk about Crooked Cottonmouth. No good! Elsewhere, “Suckas Need Bodyguards” adds another solid action sequence to the mix and the car chase between Luke and Cottonmouth’s goons was a nice visual change of pace for the show. I also continue to adore the moments when Luke uses his powers for defensive purposes, like when he becomes a bulletproof wall or when he stops a speeding SUV with his body. I have to admit, I wasn’t expecting Cottonmouth to get taken down so early in the show’s run, and I always appreciate when a genre show can surprise me like that. And while this episode was a little bit of a stumble in my book, I’m still very much looking forward to finding out who will step up to fill his throne. Standout moment: I love that Claire’s mom turns out to be every bit as no-nonsense and helpful as her daughter. She delivers a getaway van, doesn’t ask any questions, then immediately gets out of dodge. Well done Soledad! Marvel Cinematic Universe connections: Trish Talk is back! Jessica Jones’ best friend Trish Walker makes an audio-only cameo as the radio host discussing Luke’s newly public vigilantism. This might be one of my favorite ever MCU Easter Eggs because it feels like a genuine bit of world building rather than simply a callback. Burning question: Scarfe seems pretty chill about Luke’s idea of seeking protection from the police in exchange for testifying against Cottonmouth, so why didn’t he just do that in the first place? Also is it weird that Luke doesn’t recognize Claire at all? I feel like it is. I mean I know he was recovering from a head wound at the time, but they had a pretty long conversation in the Jessica Jones finale. Plus I feel like you should keep track of the people who know about your powers when you’re still in hiding.